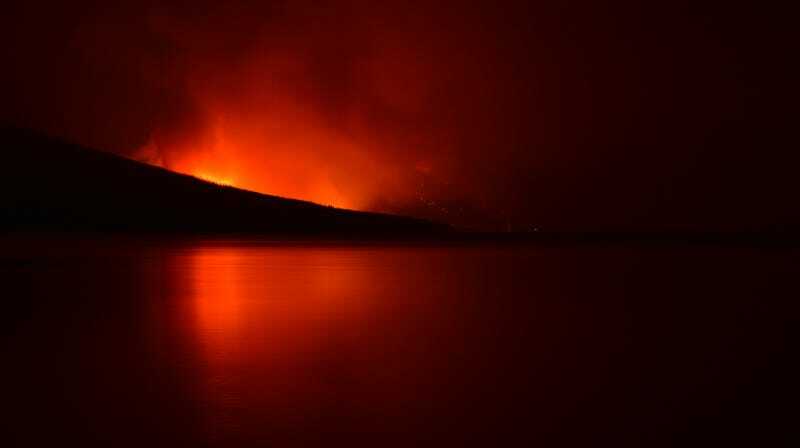 A night view of the Howe Ridge Fire on the shores of Lake McDonald. Weeks after Yosemite Valley closed due to wildfires for the first time in decades, parts of Glacier National Park in Montana have been evacuated thanks to an explosive fire. The Howe Ridge Fire “grew significantly” on Sunday according to a Facebook post by the park, the same day Glacier hit 100 degrees Fahrenheit for the first time in recorded history. The blaze has led the park to close portions of the iconic Going-to-the-Sun Road from Apgar to Logan Pass, and to evacuate Lake McDonald Lodge and Avalanche Creek Campground around 9 p.m. local time on Sunday. The park also evacuated private home inholdings and park ranger housing. According to the Missoulian, the park has requested a structure protection team to hold back the flames. There are at least two other fires currently burning in the park, all likely sparked by lightning. So far, firefighting efforts have consisted of planes dumping water, smokejumpers parachuting in, and attempts to access the fires on foot, but the blazes continue largely uncontained for now. Earther has reached out to Glacier National Park for more information on the size of the fires, firefighting efforts, and how long evacuation orders will remain in place or if they’ll expand. 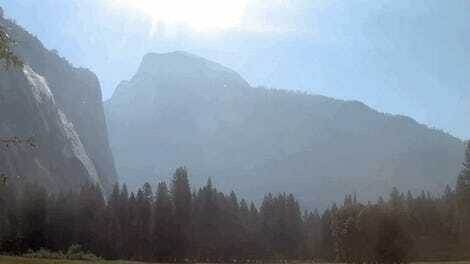 Smoke continues to obscure views and fill the sky with noxious fumes. As ash and other particulate matter falls from the sky, it could also add insult to injury for Glacier’s glaciers. Rising temperatures have caused the glaciers to recede and disappear over the course of the park’s history. The dark particles from wildfire smoke will absorb more sunlight, acting as a dark blanket that could cause the glaciers to melt even faster. Not only has it been hot, it’s been dry. According to the National Weather Service, Missoula—located about 130 miles south of Glacier—has gone 40 days without a lick of measurable rain. If the streak continues for seven , it will set a record for the longest dry stretch. Records go back to 1893 and the current record was set in [checks notes] 2017. Well then. Western Montana is under a number of fire restrictions due to the hot, dry weather. Glacier is under a Stage I ban, which essentially means folks need to be more vigilant about campfires, smoking, fireworks, and off-roading. To the south of Glacier, a Stage II burn ban is in place, which means no fires, fireworks, smoking outdoors, or off-roading. I feel like a broken record saying this, but it bears repeating that we are witnessing a new era of wildfires in the West. Rising temperatures have lengthened wildfire season by drying out fuels and melting out snowpack earlier. The increasing heat also ups the odds of explosive fires like what we’ve seen from California to Montana to British Columbia. And it’s going to get worse. Update 3:00 p.m. ET: Glacier National Park is reporting that an unknown number of structures have burned on the north shore of Lake McDonald. In addition, a Stage II burn ban will go into place for the park starting at midnight tonight, which means no s’mores for a midnight snack. Update 5:40 p.m. ET: The first estimates are in for the Howe Ridge Fire. It grew from 20 acres on Sunday to an estimated 1,500 acres by Monday. This post has been updated with comment from Nicky Ouellet.